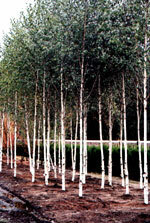 Jacquemontii Birch, also known as Himalayan Birch, have the whitest bark of the birch family. The bark peels off to reveal whiter bark each year. They have heart-shaped dark green leaves and beautiful yellow fall color. 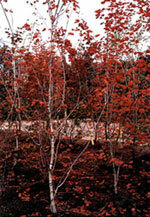 We often plant Jacquemontii Birch in a row along a property line or driveway; they are also great in small groupings. Foliage: Deciduous, Mature Height: 40 feet, Mature Width: 20-25 feet, Growth rate: Moderate, Sunlight: Full sun, partial sun, Soil: Thrives in wet acidic soil. 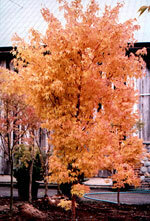 A much sought-after specimen tree, the "Bloodgood" maple maintains a red / purple color through Spring and Summer. Foliage: Deciduous, Mature Height: 15-20 feet, Mature Width: 15 feet, Growth rate: Slow to moderate, Sunlight: Full sun, partial sun. These trees are a great addition to impress a landscape where space is limited but height is necessary to give dimension to a business or estate. Alaska Cedar grow tall and slender our experience in the NW is they generally achieve a maximum height of 30 feet and branch width of 8 feet - 10 feet. These trees have a compact root structure that allows transplanting large trees with minimal shock a simple task. 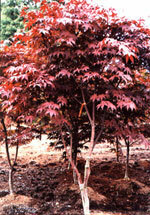 In addition to their height they offer a unique branch structure, foliage color, and foliage texture. They can be planted 6+ feet from structures and require limited watering in the heat of summer. Full sun-partial shade. These are very slow growing high mountain dwellers that add the alpine feel and go great with native plantings such as ferns and mountain huckleberry. 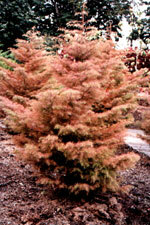 Alpine fir is so slow growing that there's no need for pruning or fear of outgrowing their space. 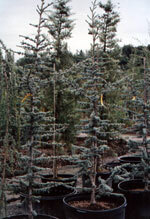 Blue Atlas Cedar or "Cedrus Atlantica" has a strong blue color with gray tones. This tree can be purchased as natural upright growing or as a weeping tree. 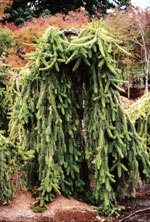 Upright they can grow very tall similar to a fir tree, while the weeping form is often 5 feet or less in height, and 4 feet - 10 feet wide like a curtain somewhat flat on two sides. Green much of the year this very unique tree turns a brilliant orange to red in the fall then back to green later in the spring. 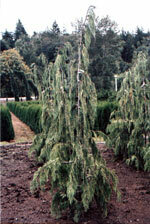 Weeping Spruce are moderate to slow growing and are a grafted tree. 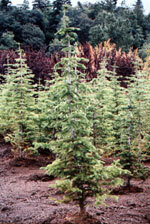 Plant in well draining soil although spruce will tolerate wet soil from time to time. Full sun to partial shade. 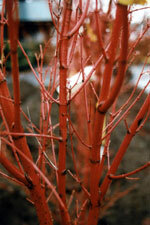 4 feet - 6 feet tall and up to 10 feet wide without pruning. 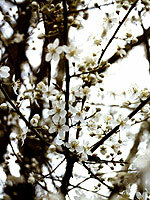 Yellow plums have a beautiful white early spring blossom and delicious small yellow plum mid-late summer. Most trees are pruned to 16 feet tall and wide or smaller. Plants in full sun - partial shade do not overcrowd. Prune during the fall as leaves drop and not more than 30% as this will for suckers. We prefer to simply prune out water suckers and lightly prune the top if necessary. Well-draining soil is best. Originally from Asia this fruit has become very popular in our region. Gourmet chefs use apricots in fine dishes, the apricot also makes great deserts and jelly. There are many varieties of this fine fruit if your favorite isn't below we can generally find it. Plant in full sun to partial shade with well draining soil. Harglow: disease resistant mid sized fruit early season. Autumn Royal: Late producer of mid sized orange fruit. Moongold: small late season golden fruit, does well in the Pacific Northwest. Sun Glow: Mid season heavy producer. Cherry pie for George Washington's birthday, Cherry blossom festivals and so much more. We eat this small but addicting fruit in so many forms and in so many things that I can't mention them all. What would life be like without fresh cherries, pie, cake, ice cream, Cherry Coke, dried, in yogurt, cherry pie filling atop Smores. Yes, the cherry has a particular place in our memories, taste buds, and throughout history. You can have your tree weeping, flowering, or fruiting and what you like you can have. For weeping or flowering varieties just contact us. Plant in full sun to partial shade with well draining soil. Bing: mid season producer of large dark red fruit. Black Tartarian: A great pollenizer for other cherry varieties this tree produces a firm black fruit early in the season. Republican: also know as Black Oregon and producing small black fruit late season. Rainier: very popular producing Yellow/pink skinned fruity midseason. Royal Ann: Who doesn't like royalty? This is a great producer of yellow/pink fruit midseason. Yes we can grow figs in the Pacific Northwest with great success. These trees can be maintained in container gardening, as a specimen, or just a great summer shade tree. Plant in full sun to partial shade with well draining soil. There are many varieties of figs that grow well in our region, below are a couple. Mission: Black skin with pink flesh. Osborn Prolific: Red/brown skin with amber/pink flesh does very well in our climate. As a nickname she's such a peach, in desert a cobbler or atop ice cream, you may like fresh, frozen, jelly, canned, in a drink? We love our peaches in most any form and there are some that do very well in western Washington. Plant in full sun and well draining fertile soil. Frost: A freestone variety producing mid to late season mid sized fruit. Does very well in our region. Reliance: An early season medium-large yellow skinned fruit. The pear- shaped like teardrops from heaven you often love or not so much this great fruit. Eat them fresh, in salads, sauce, or canned there are many varieties to choose from. We use the pear in planter displays and orchards. Flowering varieties are placed where blossoms not fruit are the preference. Plant in full sun and well draining fertile soil. Anjou: Available in yellow and red skinned varieties this pear has very good flavor and produces late season. Bartlett: The rock star of pears everybody has heard the name Bartlett and with good reason. This pear is widely grown in the Pacific Northwest for its medium to large midseason fruit. We recommend this pear as the best all around variety. Harrow Delight: Although smaller than Bartlett this pear was made for colder climates and has a great flavor. Are you plum crazy? We are. This fruit is such a heavy producer that we can't ever use them all. Although some say plum and others say prune these are very close relatives. Prunes are a European variety with very high sugar content making them an excellent dried fruit. When I hear plum it reminds me of summer days eating them fresh off the tree, for others its plum pudding, or juice. You can expect up to 150 pounds a tree with many varieties. Plant in full sun and well draining fertile soil. Italian Prune: Probably the most well know name in the European family this tree is a very good producer of oblong dark blue to purple medium sized midseason fruit with yellow flesh. There are many other varieties. Please contact us to locate others for you. "The Official nut of Oregon" Also known as a filbert, these trees grow as a small grouping or individually and produce a large amount of small hazelnuts in the fall. Nuts are harvested from the ground and will often still have fuzzy leaf like skin over the shell. There are many varieties of Hazelnuts. Contact us for particular varieties.